On 9/18 Senior Tour Auto racers was on hand at the New London Waterford Speedbowl for “Motor Jam 2016”, Connecticut’s largest custom car show! There was action both on the track and off the track. The parking lot was filled with custom cars and the track was very busy with motorcycle stunts, burn outs and racing. Something for everyone! Between the heats and features Motor Jam had something on the track at all times. Stunt Motorcycles, burnouts and so much more! It was busy on the track and also off the track, with a custom car show going on in the parking lot with vendors and food! Then it was time for STAR to hit the track for their feature races. First up was the Sportsmen division for their 15 lap feature. When the checkered came down it was on Bob Seward from Ma in his #69B coupe to take the victory for the Sportsmen and the feature win. Curt Snow from Ma in the #110 coupe took a very close second and rounding out the pack with a third was Rick MacDowell from Ma in the #76 Camero. Seward was brought trackside for an interview and award with a beautiful plaque. The Modifieds were staged and ready for their 15 lap feature. Then it was off to racing with the last checkered flag dropping down on Charlie Wilcox from Ct in his #8Ball coupe to capture the feature win for the modifieds. Scott Poirier also from Ct in the #73 Pinto pulled a very close second and topping the pack off with a third was Tom Beauagard also from Ct in his #51 Pinto. Wilcox was brought trackside for an interview and awarded with a beautiful plaque. Interesting did you notice the top three in the Sportsmen division were all from Massachusetts and the top three in the Modified division were all from Connecticut. Coincidence? 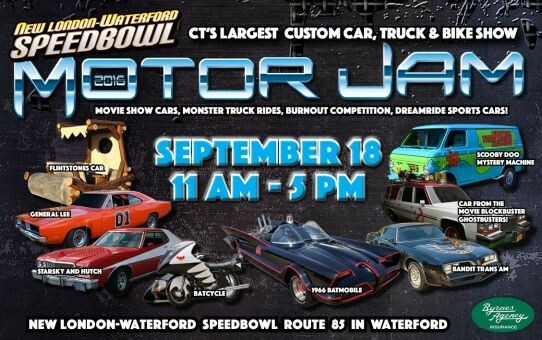 STAR would like to thank Motor Jam 2016 and New London Waterford Speedbowl for a great day of racing and all the great entertainment by all the other shows on hand. HATS OFF TO MOTOR JAM 2016!